Royal Liverpool came as the second round in a rather special golf tour. We started at Royal Lytham, followed by Royal Liverpool (Hoylake) before the short hop over to Belfast to plan Royal County Down and Portrush. Now, it would be safe to say that we were probably expecting Royal Liverpool to be the 'weakest' of these amazing 4 courses but actually it more than held its own and was a really fantastic experience. The clubhouse itself is very welcoming - there was no distinction between visitors and members in terms of facilities you can use. It is also steeped in history with plenty of memorabilia to keep you entertained as you wait for your tee time. As for the course itself, it would be safe to say it starts rather inauspiciously. The 1st hole (3rd when they have the Open here) has internal out of bounds on the right and takes a sharp turn to the right after 200 yards or so and is then the best part of another 200 yards into the green from there. Now, internal out of bounds is a real bugbear of mine. It just gets my back up when I see it on a course - if it's grass why shouldn't you be allowed to hit from it! There is some logic here as it is actually the practice area but it does get my back up a little as you can tell. The course doesn't have the drama of, say, nearby Royal Birkdale. The land is pretty flat and as you look over the links it is fairly featureless but having said that it is a real thinking course. It's not long - we played it at just under 6,500 yards from the yellow tees - but you really have to think from the tees, maybe more so than more featured courses as there aren't always that many clues as to the best lines to take. In the middle section the course goes into the dunes by the Dee before back onto the flat lands leading to the clubhouse. So what stood this course apart from others on the Open rota like Carnoustie and Lytham? Well, for me it was a very playable golf course. You didn't have to smack driver off of every tee to be in a hole, the par 5s were not monsters (the longest was 503 yards) and it was a course I managed to score quite well on. The penalties on the course for being in the wrong place are probably more penal than some courses - deep pot bunkers and very thick rough - but it's a very fair test and one that I really want to get back to see again. As a side note, since the Open returned here in 2006 it has been won by both Tiger Woods and Rory McIlroy and if you judge a course by the pedigrees of its champions then you can't say much better than that! Royal Liverpool has embraced the age of online booking and you can simply go to the website and book the time you want here. Times are pretty freely available in the week and while you can't book times online for the weekend if you phone them they have some limited availability. Green fees peak at £215 in the summer at the weekend but you can get on from November to February for £100 which if the weather is fair could be the canny choice.. The course itself isn't far at all from Liverpool and that is a great place to base a trip to this area. There is a really wide range of accommodation available, I stayed at the Hilton hotel which is a short walk from the Albert Dock and we ate at the Panoramic 34 restaurant which gives fantastic views over the city and beyond. There's a good guide here to places to go to keep you entertained for a night out. You could quite happily do a truly world class golf trip in this area, it would be perfectly reasonable to include Royal Lytham and Birkdale. 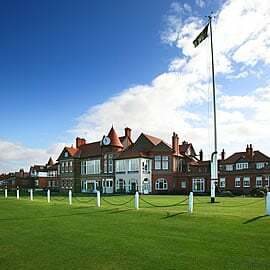 Lytham is just over an hour's drive north of Liverpool very close to Blackpool which is another spot to consider for a night's fun while Birkdale is between the two. Hillside is a course with a great reputation (near to Lytham) which could be added and Formby is another. If you wanted to stay in the Liverpool area though and make Hoylake the highlight of the trip Caldy is a good fun course and Wallasey has a good reputation, even if I didn't see it at it's best!